Since 2015, the CDC’s estimate of the uninsured has been stable at 10-11 percent. This is pretty obviously the final steady-state result of Obamacare, and it represents a drop of 6 percentage points since 2013, or about 17 million people. We only have 28 million to go to get everyone covered. I’m a little surprised the number is so low for the non-elderly, though I’m not one to talk. It was only a few years ago that I ever bothered to get one. I wonder what the big dropoff in 2004 was all about? Ah, wait: according to the technical notes there was a flu vaccine shortage that year. The funny thing is that it seemed to have a surprisingly long-term effect. 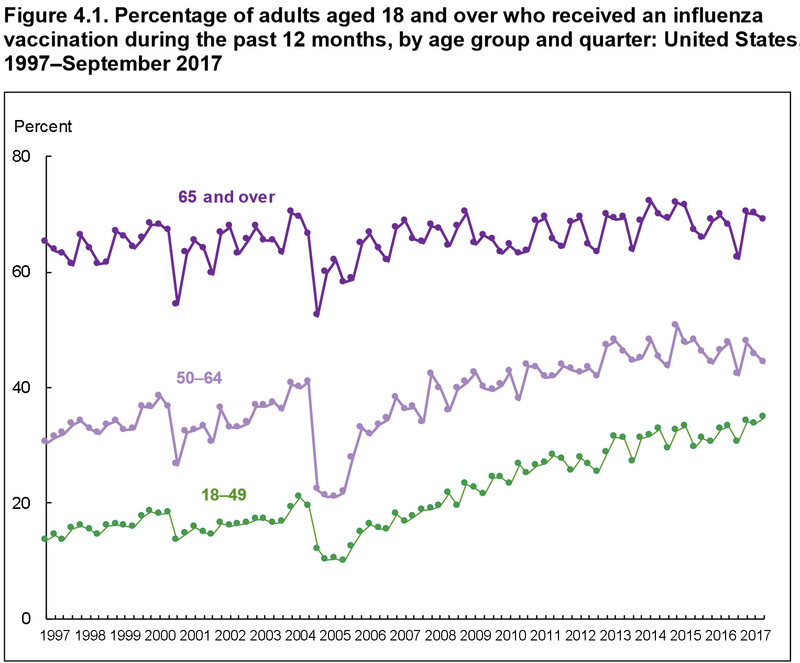 Just by eyeball, it looks like it took about five years for the number of people getting a flu shot to catch up to its old trendline.